Detroit Food Justice Task Force, a consortium of People of Color led organizations and allies that share a commitment to creating a food security plan for Detroit that is: sustainable; that provides healthy, affordable foods for all of the city’s people; that is based on best-practices and programs that work; and that is just and equitable in the distribution of food and jobs. Three Lyons Creative was asked to design and illustrate a 62-page cookbook that would elegantly communicate recipes written "with the urban child in mind." Chef Kamaria Gray, the health food chef for Detroit Youth Volume's violin program, worked with her students to craft recipes that were healthy, delicious, and accessible to children in Detroit. Our primary goal in art direction was to create a digestible, engaging experience for both children and adults. We began by researching Detroit Food Justice Task Force, reviewing the content, and meeting with Linda Campbell and Chef Kamaria Grey to discuss direction. We then sorted and edited material to be mapped out into spreads. The theme in Chef Kamaria's introduction and the theme we applied throughout was integrity — integrity for food access, nutrition, and the people of Detroit. We developed a clean, organized, two-column template which then informed the look of the book. 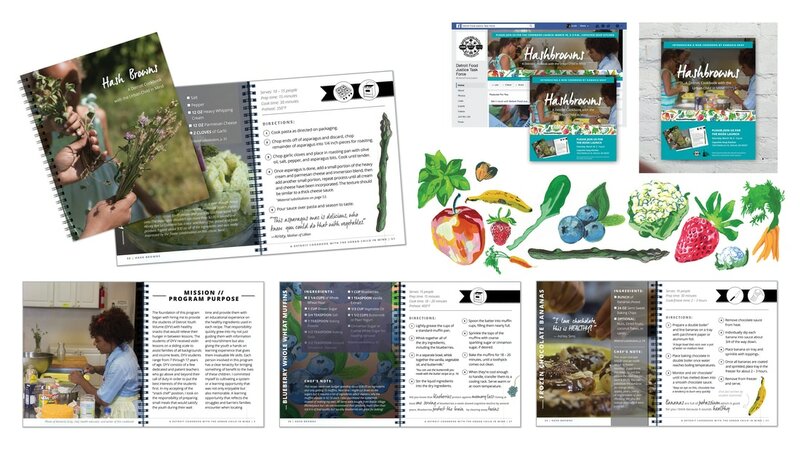 We utilized large text for the ingredients and instructions for easy reading for children and crafted chef's notes in a smaller type size for adults. We incorporated a mix of action photography, final product stills, and vibrant, hand-painted illustrations. After a few rounds of revisions, we sent final files to print with a union, Detroit printer. The final cookbook was received with praise by the Detroit community. The book is used as an education tool that addresses food access in urban areas, healthy eating for kids, and fun, youth-friendly cooking. The cookbook launch in March 2017 was widely attended thanks to 3LC's promotional media and the book now serves as a fundraising tool for Detroit Youth Volume's health snacks program.